Short Term 12 is a film that could have easily been done in a cliche way. I’m sure everyone has seen their fair share of gritty but cheesy films that so helplessly aim to inspire and strike a cord in the viewer. Short Term 12, digging into the understated issues facing its characters, successfully hits all the themes and is able to inspire without being the least bit cliche. The story starts out with a group of people who work at a group home for troubled teenagers. Grace (Brie Larson) is the young supervisor of the facility. Despite seeming like the calm and collected supervisor to the troubled bunch of kids, Grace deals with issues of her own. She has dark emotions, from previously living with her abusive father, that she doesn’t know how to deal with. She lives with her long-term boyfriend, Mason, who also works at the group home. Even Marcus doesn’t like being seem as “troubled.” When the new worker at the facility introduces himself, he ignorantly says about how much he wants to work with “underprivileged” teens. Marcus gets furious at the utterance of the word and starts cursing at Nate, the new worker. This single scene provides the basis for this review: Short Term 12, showcasing the deep natures of its characters, provides an intimate look into the nature of a not very discussed environment. Sure, PBS specials, documentaries and so forth are made over foster kids, troubled teens, and the underpriviledged. 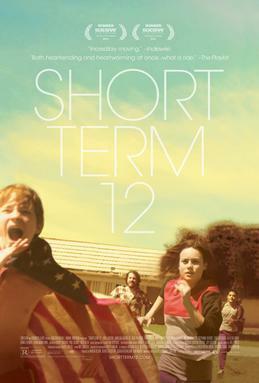 Short Term 12 is different. It digs deep instead of scratching the surface. It really shows why these people are the way they are. Through their challenging upbringing tales, the film’s characters form a bond that not many would understand. They’re able to give each other a companionship and sense of belonging that an (expensive) therapist never could. Director Destin Daniel Cretton made a film about a really crappy and screwed up environment without making the viewer feel crappy at the end. Brie Larson gives a knockout performance as Grace. Larson does so well in conveying emotions with just her facial expressions. She doesn’t have to give any hysterical cries or throw a fit, she shines with her performance in the way her face reacts in the scenes.